Rapid Freight Solutions is owned and backed by Alliance Creative Group, Inc. and the sister company of Primary Truckings. Rapid Freight Solutions utilizes todayâ€™s technology to ensure our capabilities to move freight around the country fast & safely. 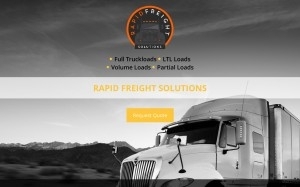 Rapid Freight Solutions specializes in LTL, truckload, air freight, hot shot, trade-show, flatbed, intermodal, over-dimensional, step-deck & refrigerated. Due to our 30 years of experience we have developed relationships with over 140 carriers nationwide to ensure our customers quality service & competitive pricing.